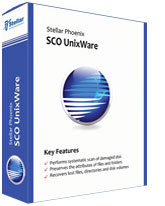 Stellar Phoenix SCO UnixWare Data Recovery 1.0 - Download Win Apps. Stellar Phoenix (SCO UnixWare) Unix Data Recovery Software..
SPSUWDR is NON-DESTRUCTIVE and READ ONLY file & volume recovery software that helps you in recovering your all-important data. Scans hard drive for missing volumes and presents a list of searchable volumes.Verifies integrity of corrupt data structures and builds file tree.Performs data recovery from Missing or Lost folders.Preserves most file attributes when restoring files & folders.